can counters be removed from permanent not on the battlefield? 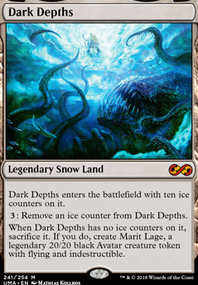 I’d add AEther Snap ; in some scenarios it even nets you some extra value in addition to bringing out marit lage in swift fashion. When Felidar Guardian enters the battlefield, you may exile another target permanent you control, then return that card to the battlefield under its owner’s control. "Another", being the key word. If Felidar Guardian is incapable of Bouncing herself over & over alongside a mass mill engine like Altar of the Brood , I'll be more than happy to remove the combo from there. -1: Exile another target permanent you own, then return it to the battlefield under your control. So why does so few use Aminatou in Superfriends? Just with her Second Loyalty Ability can she bounce Walkers you control w/o the risk that you can't use them again on the same turn. I suspect they'll try to force AEther Snap into the meta. Silas Renn, Seeker Adept : There are some very useful artifacts in this deck, it's another way to get them back from the graveyard. The 2/2 body with deathtouch can force an opponent not to attack (you). Death Wish : In my playgroup we play with a wishboard. 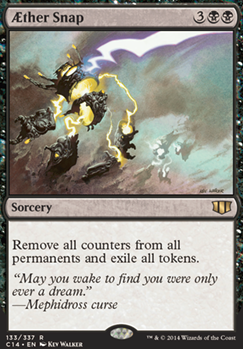 That means, that you have up to 15 cards in exile (like the sideboard). In the current commander rules no wishboard allowed, but as always this is something you have to clear this specific rule with your friedns and opponents before the game. You may change this card with any other of the listed Maybeboard or any other card. Mission Briefing : If you need a recursion you may play Flood of Recollection or Archaeomancer . Price of Fame : I like Ashes to Ashes , but any other destroy effect does the same as Price of Fame . I've this card in the deck because it can easy destroy any commander creature and has the "Surveil"-ability. 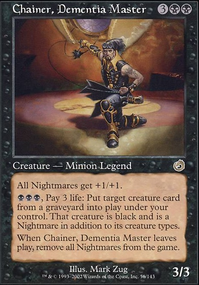 Jace, the Mind Sculptor : Easy to replace, because this planeswalker card isn't very important. If you really want to play a planeswalker Jace Beleren is a playable option. 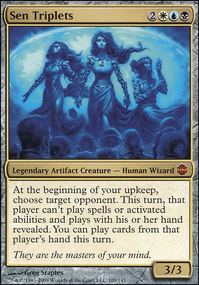 Many cards have the Guilds of Ravnica Dimir ability "Surveil", wich is useful for the commander Lazav, the Multifarious . If you don't play many Surveil cards, than skip Enhanced Surveillance . Is AEther Snap legit for the list?